Summer is in full swing, and the weather is hot. What is a body to do when it’s simply way too hot to be outside? 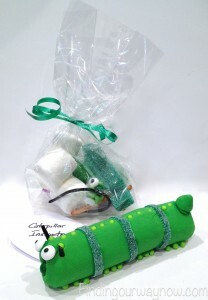 I decided to create some marshmallow critters, one being these marshmallow caterpillars. These little marshmallow caterpillars were just what were needed to have a bit of fun on a hot summer day. It always takes a bit of figuring to get the right materials and establish the best way to assemble the end product. So where did this inspiration come from? That’s simple. I had been gardening in the cool of the morning, and I ran across the usual suspects: caterpillars, bumblebees, and ladybugs – a gardener’s best friends. 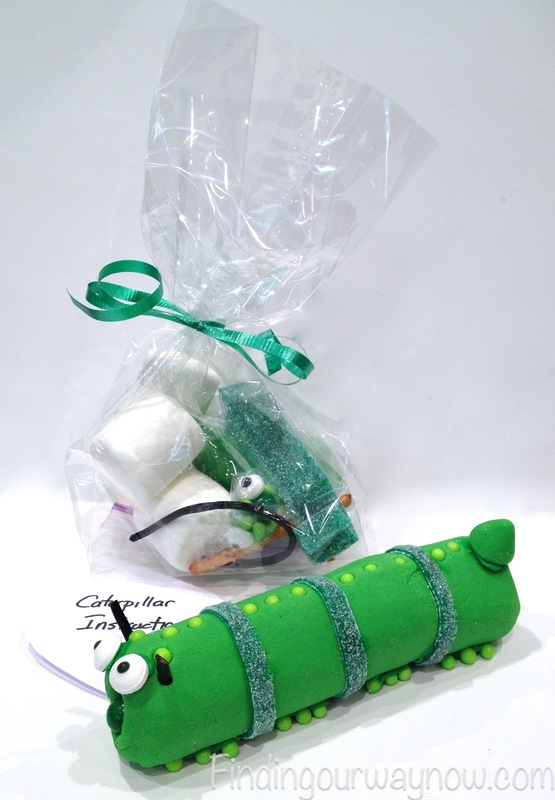 These marshmallow caterpillars can provide great fun for an outdoor event or gathering by placing them in different places on the table. When your event is over, give one to each of your guests to take home. Now let’s begin. Step One – Using four regular marshmallows and 3 pretzel stick halves, connect each marshmallow together until they are all in a tight roll. Step Two – If you don’t have a pastel green fondant, combine the white and green fondant and knead until completely blended achieving a pastel green color. Roll out the fondant to 1/4 inch thickness. Place the roll of connected marshmallow on top. Step Three – Gently roll the fondant around the marshmallow roll. Cut off the excess fondant, press and smooth to seal the seams. Place the covered marshmallow roll seam side down. Step Four – Using a bit of fondant shape a small wedge to form a stubby tail. Coat the bottom of the wedge with green icing and gently press on one end of the covered marshmallow roll. Step One – Measure the green sour strips by wrapping them around the body and cut to size. From the measured strip, cut 3 green strips approximately 1/2 inch wide. Wrap the cut ribbons around the covered marshmallow roll approximately where the marshmallows are connected to each other. On the seam side of the covered marshmallow roll, place a dab of green icing at the point where the two ribbons come together, then place it seam side down. Step Two – Decide where you’d like to add a bit of detail. Gently push the toothpick in and out to create a hole and push a green candy ball into each hole. Note: I keep it simple by only doing a ridge down his back. Step Three – Now we are going to create the face. On the opposite end of the tail, place two dabs of green icing where the eyes will go. Gently press on the candy eyes. Below the eyes in the center create a hole with a toothpick large enough for a large green candy ball, and then gently push the candy ball into that hole for the nose. Step Four – Using the black licorice vines. Cut a two small pieces, about an inch long, for the antenna. Cut off the tip of each piece at an angle to create a point. Create a hole with a toothpick and then insert the blunt end of the licorice pieces into the hole. Let everything set for a bit before going the next step. Step Five – With a toothpick place a few marks on each side to show where the body touches the sheet pan. Gently turn the caterpillar over to reveal the underbelly and marks. Using the marks as a guide, draw a bead of green icing along the length of the body on each side, stopping at the section that represents the head. 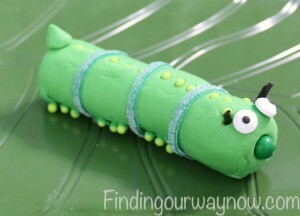 Now press three green balls into the icing on each side of each section of the caterpillar. Gently set the caterpillar down on a parchment lined sheet pan. Note: Check the green balls and push them back into position if needed. Last Step – Now repeat to make as many as you like. Voila, you now have some cute marshmallow caterpillars. Notes: It’s important to follow each step in the order presented for these marshmallow caterpillars. It makes this fun project go much more smoothly. I use pretzel sticks as connectors so that the whole thing is edible and for the safety of little children. I find that using a pasta maker to roll out the fondant gives me a consistent thickness in a hurry. If you don’t have one of these, you can use a ruler or rolling pin bands. I like using a sheet pan lined with parchment for easier assembly and cleanup. I know you’ve seen some of my other Marshmallow Critters before, so I know what you’re thinking – These marshmallow caterpillars sound so complicated, I couldn’t possibly make them look that good! Am I right? They aren’t, as long as you follow each step in the order they’re presented and keep it simple. If you’re looking for something to do and want to have a bit of fun, give these marshmallow caterpillars a try. 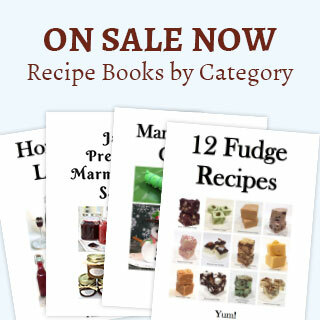 The best part is you can use any color fondant, decorations or balls that you’d like. 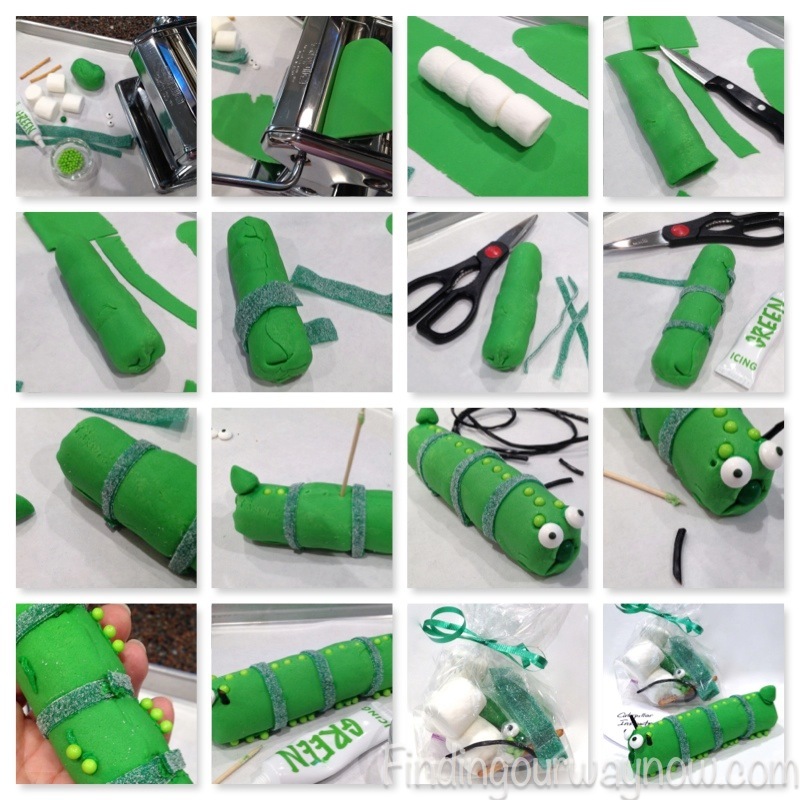 The idea is to have fun with it and create your own critter. The crazier the creation, the better and it makes for a great deal of fun. A cool thing to do is to create a package of all the ingredients with a bit of ribbon along with a set of instructions and give it to someone who’d enjoy it. Better yet, use this as a project for a fun evening with friends. So, as I said before in my other marshmallow critter projects, make your list, check it twice, get thee to the store and have some fun. Oh, and, by the way, keep an eye out for more of my fun marshmallow critters coming very soon. If you enjoyed these “Marshmallow Caterpillars,” check out my Two Easy Fondant Recipes, Homemade Marshmallows, Marshmallow Sheep, and Gift Idea Recipes From The Kitchen.